The Fifty Factor: What Do Five Words Say About You? Five words can help you get to know someone. Recently I received 5 words from Betty, at A Glimpse Into Midlife. It's all part of a meme, that you can do too, if you want. Here's how it works. Betty was given 5 words from another blogger and she did a post about the words she was given. She then offered to give 5 words to someone else. I thought it would be fun, so now I'm going to post on the five words she gave me. If you want to join in, tell me in the comments and I'll send you your own five words! I'm making an executive decision and assuming "Fall" is not meant to describe the number of times I've fallen flat on my derriere, because THAT, my friends, would make for a very long post! I am one of those girls who'll try just about anything and as a result, SPLAT has my name written all over it. 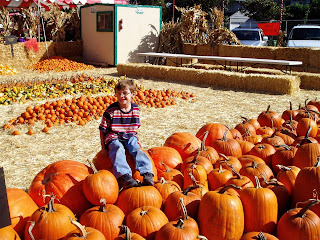 I'll let you decide if I'm taking about the pumpkins or kids. I have long since thought "the Gift is for the giver", not the other way around. Sure it's nice to receive a gift for a special occasion, or for no occasion at all, but I like the giving part of Gifts far more then the getting-- I enjoy selecting something "just right" for a person I care about and wrapping it beautifully. I also enjoy giving the Gift of "myself"-- my help and support to a loved one who could use a second pair of hands or a boost. That said, I've received two Gifts in my life that hold a special place in my heart. The first you'll know, if you are a regular reader, is of course my Godson. When I unwrapped him the very first time-- I yi yi, I'm crying already just thinking about it so I'll leave it at that. The second Gift was from my mother. For my 40th birthday, she wrote every day in a journal for three months telling me stories about being her daughter. It is one of the all time most loving and generous gifts I've ever received. It's a gift I've been trying to write/post about for some time but it always leaves me so choked up I've yet to finish. Stay tuned, hopefully I'll be able to complete the post soon. My whole adult life I dreamed of Retiring and "enjoying the fruits of my labor". Ha! I thought I had it all figure out but I forgot one important thing. What the heck would I do with myself after I walked away from a big portion of my identity. I started working when I was 13 years old and I was, and continue to be, very proud of my ability to "take care of myself". But when I hit the breaks, stopped the endless work days involved with owning my own business, and was able to kick back and sleep in, I suddenly could not sleep past 7am and had nothing to kick back and actually DO that gave me any sense of accomplishment to identify myself with. Blogging has been a big boost but I'm still on the hunt for the "ideal Retirement" with balance and fulfillment. 4. Stepchildren: I do not blog about my two stepdaughters, but I will say their father and I met when they were college students. They are beautiful, smart and accomplished women, each with a strong sense of family, generous hearts and the kind of people you'd love to have as your friend or neighbor. Hmmm. That's a word that can go in many different directions. I think I'll tell you about my Passion for food. I love to cook and entertain. I am forever clipping recipes and own way too many cookbooks but it seems I just can't get enough. Over the years my food Passion has lead me to many cooking classes, but I would love to spend long vacations in Tuscany, Provence and Israel taking classes to learn the local ways of preparing a feast. I could be very content having an endless stream of company around the dining room table enjoying foods from around the world. (A couple of full time dishwashers would be nice too.) But as I type, I realize ultimately my Passion is not really about food, it's about sharing a lovely meal with family and friends, and especially seeing my husband smiling at the opposite end of our dining room table. He's really my true Passion. "Gift" was my favorite word. What does it mean to you? I think it means being selfless. And I love, love, love, Fall. Betty gave you great words and you did so good in writing about them. My favorite word was gift also. I wanna play, I wanna play! Can I have five words to blog about? I loved this post! I'm a little embarrassed to admit that I didn't know if the leaves changed color in California or not. I hope you are able to write about the journal your mother kept for you. I think it's such a lovely idea and such a special gift. Something I might like to do for my daughter someday. It's far more fun to give and I love to give funny gifts and see how people react. I did the 5 words deal with one of my blogger friends some time back, can't remember who it was. i have been given all i will ever need in my family, and because of that i amfree to give all that i have to those that need it. fun post.your mother sounds like an amazing and thoughtful woman. Awesome post, Joanna. Hit me. I loved all of your words. I would love to have 5 words. By the way, I smile when I think about your godson and how you have such a special relationship with him. I would love to hear about the journal from you mom. Good job with the 5 words. Your mother sounds very thoughtful - and you were appreciative. That's nice to read about. You can give me five words and I'll take a shot at it. Great post. can i get five words!! I'm touched by your mother's birthday gift to you, something priceless! I love your Mom's gift. A gift of self is so precious. I'd like 5 words. I hope I can do them justice as well as you did. Very well done my friend! One of my favorite gifts was being in the delivery room watching my niece come into the world 18 years ago. I went that day and wrote her a letter and tucked it in my bible under my favorite. I feel the same way about Gifts. I get such a joy out of finding the perfect thing for someone and then watching them open it. Joanna, what a beautiful story about your Mom, that made me cry, what a thoughtful thing to do. As far as gift, i like giving to, but I can not save anything for a certain occasion as I always want to give right away. Take care, it was a beautiful post. I would like to try the five words, Joanna, though I am very scared. I could not even find anything to say about Gift. I am grateful for all God's gift. Thanks for your comments and support. It means more than you'll ever know! Joanna - you have the ability to turn five great words into something incredible - what a treasure you are to the blogging world. Thank you for sharing what each of these words means to you. I would say hit me but I doubt I could do any words justice. I do not wish to play but I enjoyed the post. I have no idea what "meme" means!! I loved what your mother gave for you as a gift when you turned 40; I bet you treasure that so much!! To me, 'gift' means thoughtful, whole hearted giving of yourself, for the pure joy of giving. You mom inspires me. I've continued to aspire and work towards being THAT kind of mom. I'll take my five words and try to do my darndest. Thanks! When I think of the word "gift", I think of something that God gave someone; as in a gifted person. 5 words that would describe me will be on my b'day next month; those words are YOUR CAKE IS ON FIRE!! Yes, I would like to play! Go ahead and hit me up with 5 good ones, but no matter how hard I'll try, I know I won't make the words sound as good as you have! Great job! And that gift from your Mom was over the top! I, too, enjoy giving gifts very much, except when they go unacknowledged. That really frustrates me. "Gift" makes me think of the intangible gifts we're born with--from the gift of gab to the gift of empathy. So, will you gift me with 5 words, too? I bet you're gonna have a lot of words to give out! Thanks! I loved that post - Great words to choose. Gift is sharing, with no expectations of receiving in return, just giving because you can. The gift from your mother made me choke up too. I would sleep with it under my pillow! Thank you so much for playing along. I loved reading this post and you picked my favorite word too. When I think of gifts, I think of giving. I love giving and I´m like you, I love giving the person a present that is especially picked out for her/him! That they know I have been listening to what they need or want. I love it when I can surprise someone with a gift too. You passion for food and cooking sounds great. I wish I could taste some of the delicious things you make. Your mama sounds like a wise precious lady. What a wonderful gift for your 40th! Thank you for sharing and blessing us with this post. What an incredible gift from your Mom. I know you will treasure that forever. I'd love to do the cooking thing in Tuscany with you. Cooking is my passion too. No autumn? WHat a loss. And I am so touched by the journal your mum made for you. Truly special. That was a great post--I really enjoyed learning more through 5 words about you! Gift--to me it means share, whether talent, possession, time or other resource. You have a gift, you give a gift. What a great post!! The gift of giving is the best!! enJOY your day!! You did great on your words, I enjoyed reading all of them. "Gift" calls to mind Faith, Hope and Love, with the greatest being Love - and that's what my entire world revolves around! My love for my husband, and our children, and our families and dearest friends! Great post, Joanna - I absolutely loved it! May I have five words, too?!?! Yes please, Joanna, I like this idea and would love you to send me five words. It was interesting to learn you have stepdaughters and that you love cooking. I have three beautiful gifts in my life - my two adult sons, and my gorgeous little girl. Your mom's gift was awesome on so many levels. I can't imagine. I love Fall as well. And that gift from your mother sounds so precious. I think we sometimes don't realize how important it is to tell others about our feelings about them. How lucky you are to have a Mom who is not only telling you but writing it down so that you can keep it forever. How inspiring! What you made out of these words is so amazing. I do believe that giving is receiving. And we can give so much, and there are so many kinds of giving. Giving hope for example. Everytime we help someone find a glimer of hope in her darkest hour, gives us the feeling that we can be helpful to someone, that soemithing we know or we can think of, opens new doors for someone in need. I'm not afraid of you; pass em on! Did I tell you how much I love coming here? #2 Gifts on your list is my favorite. You moved this cold-hearted unemotional ice rock to near tears and you DIDN'T EVEN ELABORATE!!!! Gift means thoughtful. It means you were paying attention when someone was speaking -- and that's why it's the most important to me as well. I love this and want to play. I've had the same struggles with unemployment as you've had with retirement -- although, yours was planned and mine causes fear. However, I completely understand the identity part disappearing and wondering what's next --- after 17 months, I'm finally beginning that it's time for a new career. Not sure what. Btw, can I fit in your luggage when you go to Tuscany. I'd so love to do a cooking tour. I love the five things you wrote about. Gift... a true gift in my mind is one that arrives or is delivered without obligations. Lovely post and thank you for all that you share here. Gift means wonderful blogs to read by wonderful bloggers. Fall is okay but I prefer summer. Today, It felt like summer! I couldn't agree more, while it's great to receive gifts what gives me the most pleasure is giving them. The best are those given not for birthdays, anniversaries or Christmas, but those given 'just because', i.e. I spotted something that I knew would be loved and just because I love the recipient. Yes I'd go for the 'five word' thingermie. What does it say about me that I had to think about this and I'm nervous saying that I'd take part? (I really do need to get over myself)! Oh Betty did give you some great words. I love the gift your mother gave you. It is indeed priceless. You are a gorgeous soul, truly! Yes! Please send me five words! Enjoyed your post. Hi Everyone! Thanks Betty for my five words and thank to all of you for your kind words. Several of you have played along and I greatly appreciate it. I'm looking forward to reading about YOU in your five words posts. Keep those cards and letters coming. I love hearing from you! I found your lovely blog thru Little Ms Blogger..I love this 5 post idea - what a great post!